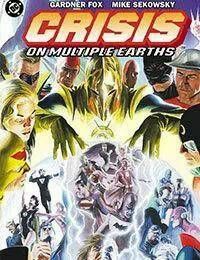 The perfect companion piece to the CRISIS ON INFINITE EARTHS and HISTORY OF THE DC UNIVERSE trade paperbacks, this book features the classic tales of interaction between the heroes of Earth-One and Earth-Two. Existing in two different realities, theheroes of the Justice League team up with their predecessors the Justice Society of America in order to save both their worlds. Featuring different incarnations of Batman, Superman, the Flash and many other classic heroes. Collects JUSTICE LEAGUE OF AMERICA #21-22, #29-30, #37-38, and #46-47.